Maison Morot’s history dates back to the early 19th century. In 1820, Philibert Jacques Angélique Morot began selling wine from his vineyard, shipped by horse-drawn carriage. In 1860, he was joined by his two sons, Simon (based in Rouen, then a major commercial hub) and Albert (based in Beaune). In 1880, Albert – then aged 50 – continued the business on his own, under his name: Albert Morot. This name was kept by his only daughter, Berthe, and his son-in-law, Louis Jean Blanlot. 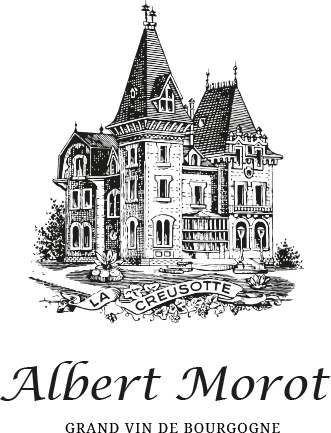 He bought the land at La Creusotte and built the Château (1898). During the phylloxera crisis, he also took advantage of the low price of vineyards to buy several hectares (1890) in Beaune and Savigny. Louis Jean Blanlot died prematurely at 52, leaving his wife Mme Berthe Blanlot to run the domaine with the help of her two sons-in-law. In 1926, she was succeeded by one of her two daughters, Yvonne. Her first husband having died at the front in the First World War, Yvonne later married Albert Choppin. The company sold its premises, wine cellars and shops located at rue Sainte Marguerite, Beaune to concentrate its activities at Château de la Creusotte. Its cellars were enlarged to accommodate increased activity. During the war, the wine was requisitioned for sale to the Germans. The Château was also occupied for a few days by the German occupation troops. The post-war years were difficult. Wine consumption was very low. Faced with financial difficulties, the domaine was forced to sell 2 hectares (5 acres) of vines. Guy Choppin, Yvonne’s eldest son, took over the running of the estate at the age of 23. Sales gradually recovered. Françoise, Guy’s sister took over and immediately stopped the negotiant business to concentrate totally on her own production. She positively changed the quality of all the production and developed the export business, which had been started after the first World War. Her great-nephew, Geoffroy Choppin de Janvry, continued the quality programme introduced by his aunt. To obtain grapes of the highest possible quality, this agronomist implemented a full range of approaches, including working the vines, green harvesting and thinning leaves, double sorting during harvesting to reduce interventions in the winery to a minimum. After a number of successful trials, Geoffroy switched to organic farming methods. He produced his first certified vintage in 2015.